Free ice cream, free sodas, free chocolate-covered pimento-stuffed olives; we like free and so does everyone. Especially during summertime when various companies start up their famous "Free Fill-In-The-Blank-With-Some-Tasty-Food-Or-Drink Days" -- scrumptious, and wallet can rest. Up on July 1st: Coffee Bean & Tea Leaf. The purveyor of pastries and lattes and chais recently put a vote to customers -- which of three spankin'-new Ice Blendeds should be the free giveaway drink? 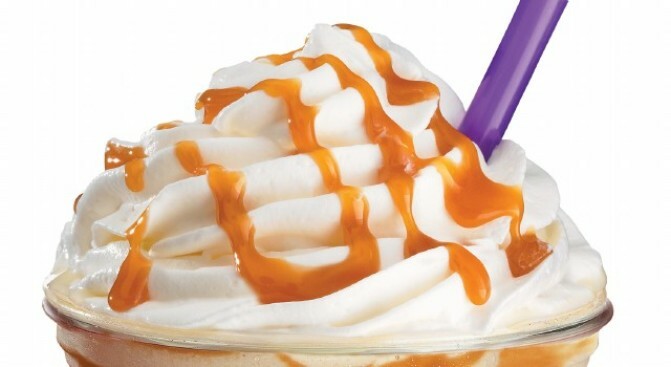 -- and caffeine fans chose Instant Karma, a caramel-nut sip. Sesame-seed-ish-ness tones. And whipped cream, too. Yes. Coffee Bean is blending Instant Karmas, for free, between 3-7PM on Wednesday, July 1st. Note that this offer is only going on at participating locations (and no Ralphs stores), so just fyi. We suppose if you're trekking out just for the drink you'll want to make sure your partic shop is part of the deal. We've always been a fan of the firm, up-to-the-creamy-task Coffee Bean straw. The little things, really.